Fransoir Jones (black singlet) takes down Olathe West's Parker Meuhe during a dual meet at Lawrence High School, January 17. 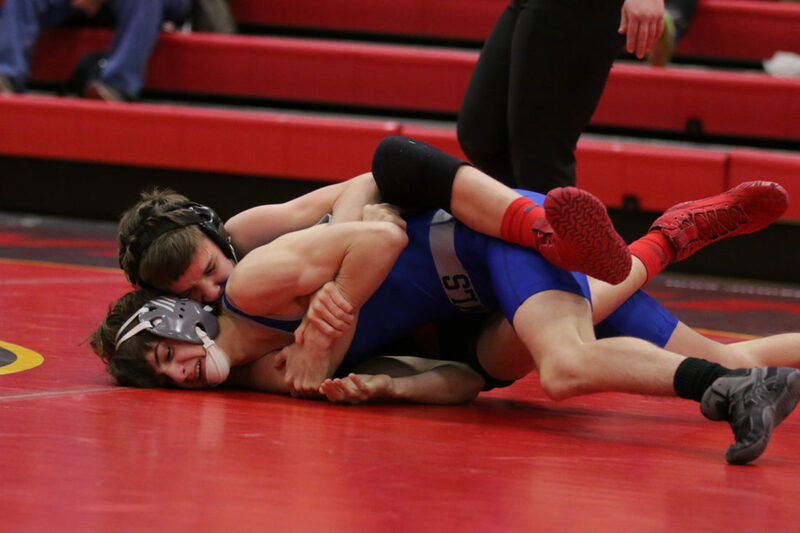 Both city wrestling teams were in action this past weekend during the Husky Invitational. 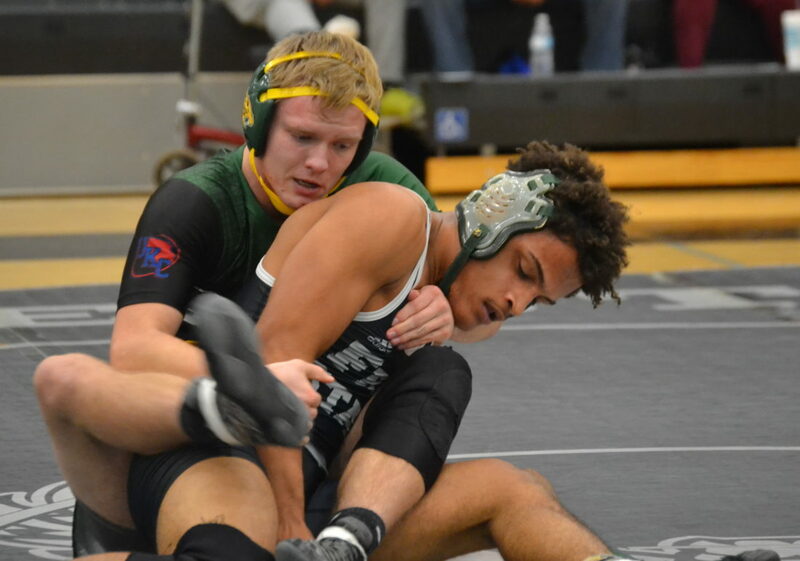 In the two-day event, which featured 21 teams, Free State’s wrestling team did well enough across the board to secure a fourth-place finish with 127.5 points. Lawrence High, meanwhile, scored 51.5 points to place 11th. Maize won the event with 218 points, while Bonner Springs finished second with 204 and Blue Valley claimed third with 151. Lou Fincher, Joey Eddis and Devin Beers netted second place in their respective weight class to lead the way for the Firebirds. 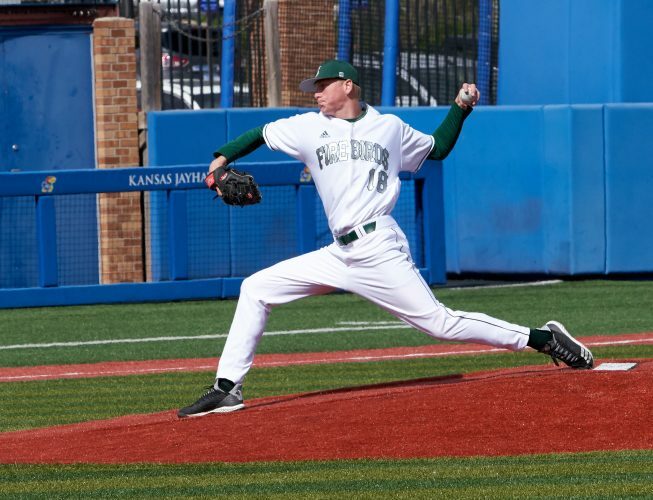 But Free State’s high finish was a result of a balanced effort from Mike Gillman’s squad. Jordan Kryfka finished third in his weight class, while Joey Schmidtberger took fourth. Austin Burenheide recorded seventh, and Chance Branson notched eighth for Free State, which is ranked No. 10 in Class 6A. 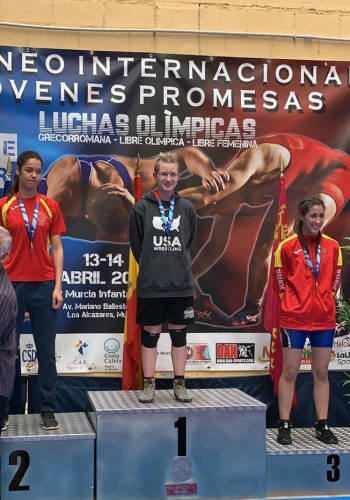 For the Lions, a trio of wrestlers netted medals to propel them to a 11th-place finish. Kevin Honas was a runner-up in his weight class. Logan Farrell and E.J. Jewsome tallied fourth and fifth place, respectively. Logan Farrell (red shoes) tries a pinning move on Olathe West’s Cole Newport in a dual meet at Lawrence High School on Jan. 17. 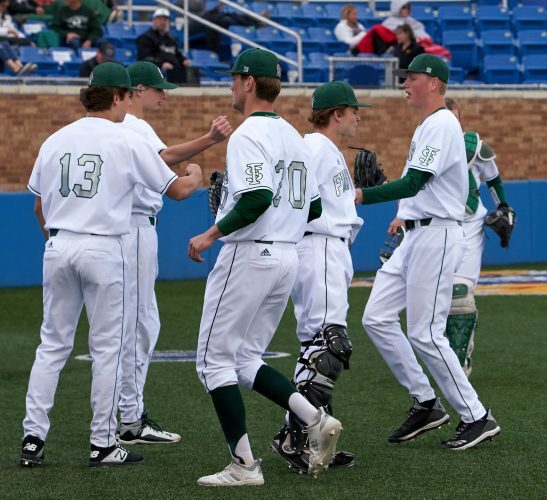 Free State and Lawrence will square off in this year’s city showdown at 6 p.m. Wednesday at FSHS. Both teams are coming off a win in their respective duals last week. 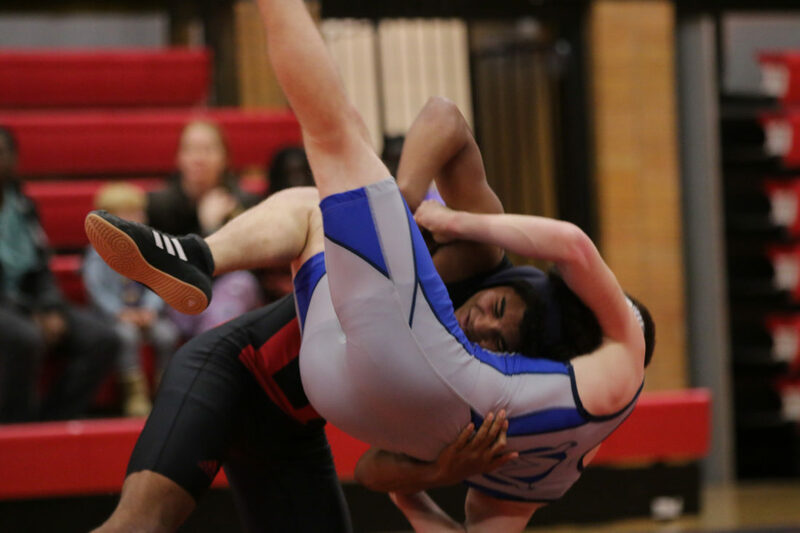 Lawrence recorded a 57-24 victory over Bishop Miege, as Logan Farrell, Andre Phommaseng, Fransoir Jones, Justin Miller, AJ Powell, Jalerio Wahwahsuck, Kyle Miller and EJ Jewsome all won their matches for LHS. Team scores: 1. Maize 218; 2. Bonner Springs 204; 3. Blue Valley 151; 4. Free State 127.5; 5. Hutchinson 123; 6. Seaman 94; 7. FL Schalgle 92; 8. Blue Valley West 89; 9. Turner 75; 10. Pleasant Hill 70; 11. Blue Valley Northwest 67; 12. 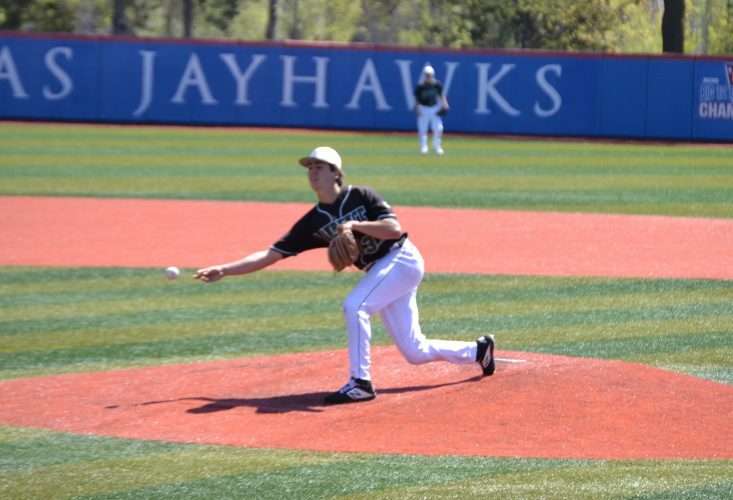 Olathe East; 13. SM Northwest 60.5; 14. Lawrence 51.5; 15. SM West 49; 16. Jayhawk Linn 41; 17. Blue Valley North 39; 18. Topeka High 36.5; 19. SM East 16; 20. Blue Valley NW 10; 21. Raytown 4. 106: Ben Mellenbruch (6-11) place is unknown and scored 0.0 team points. 113: Trey Shanks (15-9) place is unknown and scored 4.0 team points. 126: Lou Fincher (21-3) placed 2nd and scored 23.5 team points. 132: Caleb Streeter (15-8) placed 5th and scored 9.0 team points. 152: Jordan Kryfka (11-4) placed 3rd and scored 17.0 team points. 160: Chance Branson (4-2) place is unknown and scored 8.0 team points. 170: Joey Eddis (21-3) placed 2nd and scored 23.0 team points. 182: Devin Beers (20-5) placed 2nd and scored 22.0 team points. 195: Austin Burenheide (7-8) place is unknown and scored 6.0 team points. 220: Joey Schmidtberger (7-4) placed 4th and scored 15.0 team points. 106: Kevin Honas (20-7) placed 2nd and scored 19.5 team points. 113: Logan Farrell (15-4) placed 4th and scored 13.0 team points. 126: Zach Razak (1-13) place is unknown and scored 0.0 team points. 145: Henry DeWitt (1-14) place is unknown and scored 0.0 team points. 170: Tomas Ortiz (5-3) place is unknown and scored 2.0 team points. 182: AJ. Powell (15-10) place is unknown and scored 6.0 team points. 285: EJae Jewsome (13-7) placed 5th and scored 10.0 team points. 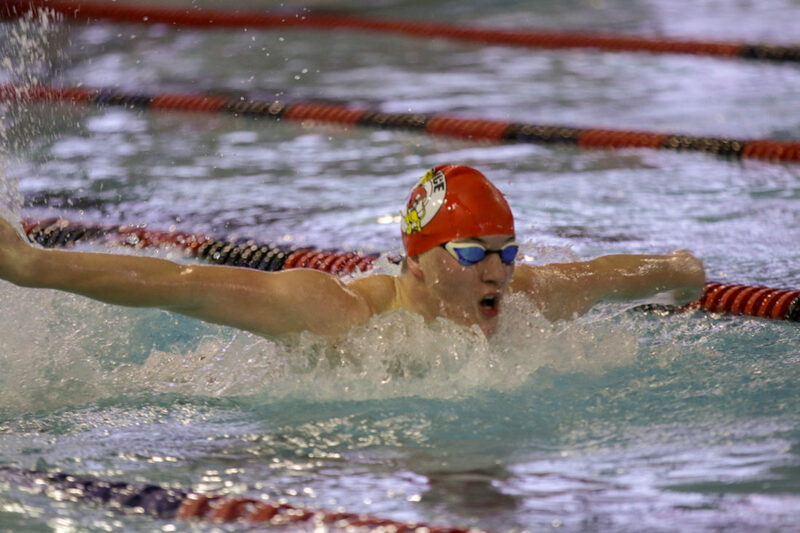 The Lawrence High boys swim team won four races to polish off a narrow win in its home meet Thursday. In their first win of the year, the Lions scored 376 points as a team. Bishop Miege placed second with 349 points, while Olathe North claimed third with 319. No other team scored more than 168 points in the six-squad event. Sophomore Tyler Jones led the way with two individual wins. He placed first in the 200-yard freestyle with a time of 2:01.10 in the second race of the meet, and then notched first in the 500-yard freestyle with a mark of 5:24.58. Senior Braden Augustine registered first in the 200-yard individual medley with a time of 2:17.21. An LHS swimmer races down the lane in the Lawrence High Invitational, January 17. To lock up the win, though, the Lawrence quartet of Jones, sophomore Giovani Lule-Paredes, senior Luke Dunlap and Augustine closed out the meet with a win in the 400-yard freestyle relay. 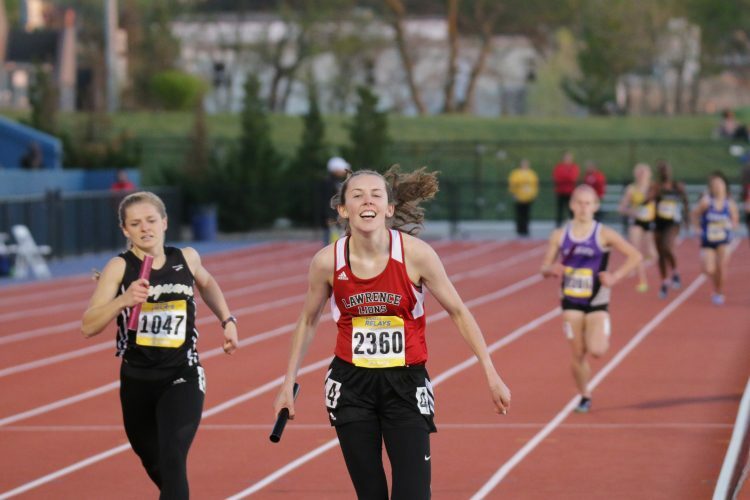 They finished with a time of 3:40.02, which was nearly 10 full seconds faster than the runner-up in the race. In addition, a number of LHS swimmers finished in the top-three in their respective individual races to provide plenty of production. 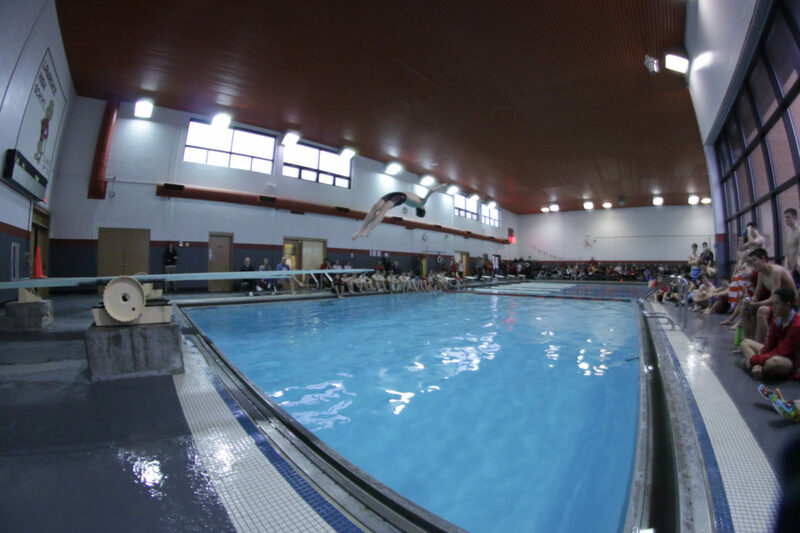 An LHS diver flies into the water during the Lawrence High Invitational, January 17. Lule-Paredes thrived in multiple races, claiming second in the 500 freestyle and placing third in the 200-yard individual medley. Dunlap was a runner-up in the 50-yard freestyle, while Augustine also tallied second in the 100 freestyle. Senior Nathan Stoddard took third in the 200-yard freestyle. Freshman Keyan Crawford and sophomore Salvador Good tallied second and third, respectively, in the diving competition. Lawrence will travel to Hummer Sports Park at 12:30 p.m. Tuesday. 200 medley relay: 3. Giovani Lule-Paredes, Logan Grose, Alexander Arnone, Jack Morse, 1:57.88. 200 freestyle: 1. Tyler Jones, 2:01.10; 3. Nathan Stoddard, 2:07.94; 6. Trenton Snyder, 2:15.44. 50 freestyle: 2. Luke Dunlap, 24.67; 8. Jack Anderson, 26.07; 10. Andrew Severn, 26.63; 14. JJ Smith, 27.27; 15. Jake Signor, 27.35; 17. Logan Grose, 27.44; 18. Jack Morse 27.82. Diving: 2. Keyan Crawford, 185.50; 3. Salvador Good, 179.55. 100 butterfly: 6. Alexander Arnone, 1:16.25; 11. Will Damron, 1:33.31. 100 freestyle: 2. Braden Augustine, 53.00; 5. Luke Dunlap, 56.24; 6. Nathan Stoddard, 58.36. 500 freestyle: 1. Tyler Jones, 5:24.58; 2. Giovani Lule-Paredes, 5:31.54; 6. Trenton Snyder, 6:15.83. 200 freestyle relay: 2. Luke Dunlap, Andrew Severn, Nathan Stoddard, Braden Augustine, 1:39.04. 100 backstroke: 6. Alexander Arnone, 1:15.76; 7. Jake Signor, 1:17.19; 9. Andrew Augustine, 1:22.55. 100 breaststroke: 4. Logan Grose, 1:14.58; 6. Andrew Severn, 1:16.91; 10. Reed Pfeifer, 1:19.70. 400 freestyle relay: 1. Tyler Jones, Giovani Lule-Paredes, Luke Dunlap, Braden Augustine, 3:40.02.